Last week, Michigan's South Lyon East High School became one of the latest US high schools and colleges to stage their production of The Phantom of the Opera. We've heard from the show's Set Designer, leading actors, Pit Musicians, and taken a glimpse at the final Dress Rehearsal - in this latest blog, we look back at the early stages of the production and how the school community came together to fund the show. "Wow! Our High School is performing The Phantom of the Opera! (Now, how do we pay for it?)" "Financing high school theatre productions is certainly a challenge, especially in these economic times. Each school and parent booster organization has a different budget for these activities. Each director has a different philosophy as well, which affects how the money is allocated. For example, the chandelier - you can spend as much or as little as you want, depending on how important this effect is to your production. One director may want the 'whole ball of wax' and hire a company for this purpose, while others may feel the money is better spent on other aspects of their show and either build their own version of the chandelier or use lighting to simulate this effect. "The SLEHS parent drama boosters started planning our fundraising efforts as soon as we found out our director wanted to produce The Phantom of the Opera. Some of the activities have included a very successful rummage sale, a spaghetti dinner, and more traditional fund raising (product sales). We also were given the chance to hold fundraising nights at a local restaurant, in which the owner graciously donated some of the profits back to our program on that particular night. Several of our parent boosters are making beautiful 'Masquerade' masks to sell at our shows. We have had the support of these activities from our community, which is wonderful, because we couldn't do this without the support of these local businesses, as well as the businesses who bought ad space in our program. "We are also arranging with other local high school to sell and/or rent our set pieces and costumes from our Phantom production. 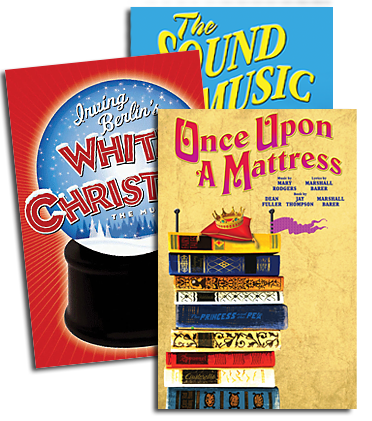 As more schools perform this show, more set pieces and costumes will be available for schools to rent or buy, which will eliminate a lot of expense and labor. Needless to say, our ticket sales have been exceptional due to the popularity of Phantom. We have also been marketing the show to the surrounding communities. "Performing The Phantom of the Opera has been an amazing experience for our students at South Lyon East High School. I would encourage any school theater department considering performing Phantom to do your homework, plan in advance, and remember that regardless of how simple or elaborate your production is, the most important factor is the theater education of the students involved, and showing your community that supporting the arts in the schools is more important than ever."